By 1500, the short wave disturbance had moved over the fire area. It brought strong winds from the northwest, shifting to westerly, that overpowered local diurnal winds. Driven by these strong winds, the fire began to make rapid, intense runs simultaneously in Cramer Creek and the Cache Bar drainages. At H-1, gusts up to 30 mph were reported, and crews in that area moved into the black as a safety zone. 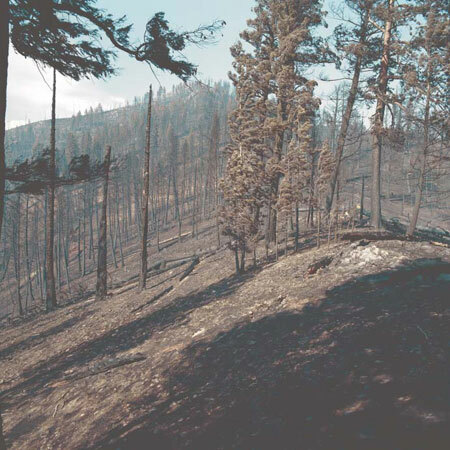 In Cramer Creek, the fire intensity was rapidly building on the northwest perimeter, and transitioned from a surface fire to a crown fire as windspeeds increased and the fire encountered more continuous crown fuels. A large, brown column formed in the Cramer Creek drainage, pushing vertically to 12,000 feet and moving eastward toward the town of Salmon, ID. 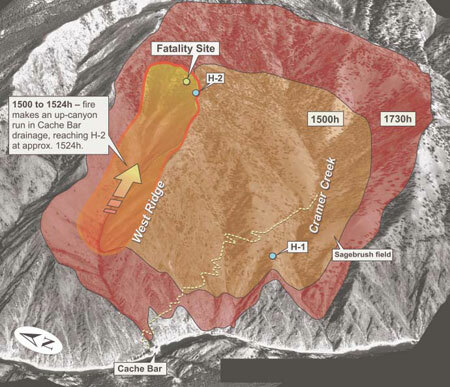 An active, moving fire front had become established in the bottom of the Cache Bar drainage (figure 25). 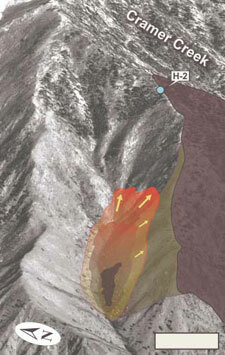 Pushed by strong winds, the fire front began to move upcanyon toward H-2. As the wind shifted to a more westerly flow, winds aloft began to align with the Cache Bar drainage. The fire moved rapidly upcanyon (figure 26), with spread rates and intensities much greater than witnesses had expected. Preliminary modeling indicated that during the early part of the run in the drainage bottom, the fire was moving through the ceanothus brush at a rate of 80 to 90 feet per minute with flame lengths up to 9 to 12 feet. Figure 25—Between 1430 and 1440, smokes in the bottom of the Cache Bar drainage turn into a flaming front. 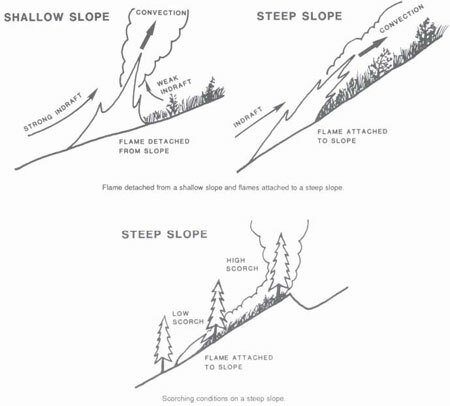 Figure 26—At 1500, a fire front begins to move upcanyon and up to the base of the slope below the West Ridge. 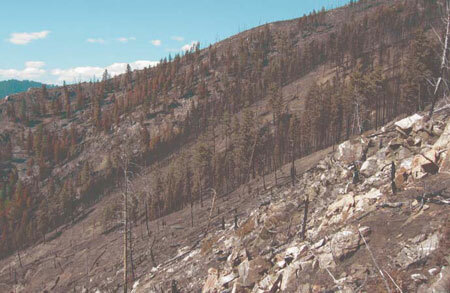 As the fire advanced up the Cache Bar drainage, it began to burn up the slope below the West Ridge through green and underburned brush and downed woody fuels (figure 27). The entire upper portion of the Cache Bar drainage erupted into flames which ran uphill. Flame lengths averaged 20 feet in brush and 50 feet at the leading edge. The fire was not one solid front, but simultaneous movement of smaller fronts that followed stringers of more continuous fuels. When the fire encountered rocky areas on the slope, the fire front did not stop—flames swept over them as if the rocks were burning as well. Postfire modeling indicates the spread rate was 130 to 150 feet per minute (fuel model 6), consistent with witness descriptions of the event (figure 28). Actual flame lengths witnessed and evidenced by tree/snag bole scorch height exceeded that predicted for fuel model 6. This may have been partly due to the brush being dried and preheated by the backing fire earlier in the day. Figure 27—Between 1513 and 1520, the fire front intensifies and continues to move upslope below the West Ridge. Figure 28—At 1520, the fire front, based on a model projection, reached the base of the ravine below H-2. Figure 29—Location of elevation profile line in figure 30. Figure 30—Elevation profile along a line from northwest to southeast, running through H-2. The air attack pilot noted that as the fire in the Cache Bar drainage increased in intensity after 1500, strong indrafts were produced, indicating extreme burning conditions. 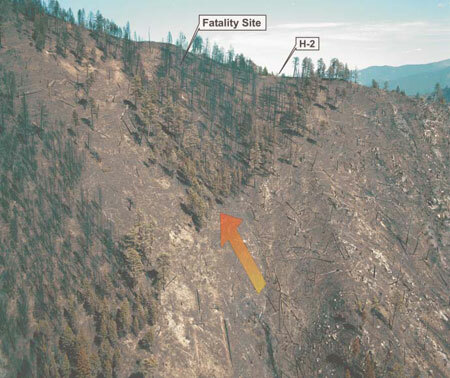 At the leading edge of the fire, updrafts caused the plane to gain 1,000 feet, and at the trailing edge of the fire, downdrafts would cause the plane to drop 1,000 feet when the plane passed through those areas. As the fire increased in intensity and speed and burned up the brush-covered slope in the Cache Bar drainage, it laid closely against the slope. The smoke movement also remained close to the slope rather than forming a more vertical column, rolling over the West Ridge and eventually joining the main column in Cramer Creek. When the fire front moved into stands of trees in the upper part of the drainage, it did not immediately consume the canopies. Crowns at the lower end of these stands were dried, but not scorched. Bole and crown consumption indicate the flaming front remained close to the ground, gradually moving higher into the crowns as it progressed up the slope. The fire did not begin to fully involve the canopy until about halfway into the stands (figures 31, 32, and 33). Figure 31—View of the ravine at the base of the slope below H-2 in the Cache Bar drainage, from below the stand of trees under H-2. 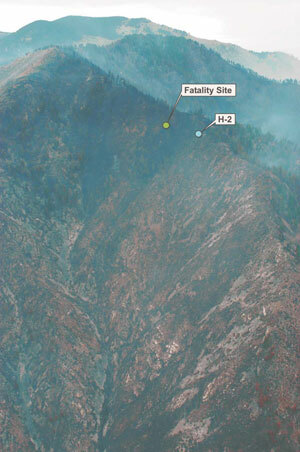 Figure 32—At 1523, the fire front, based on a model projection, reached the base of the stand of trees below H-2. Figure 33—At 1525, the fire front, based on a model projection, reached H-2. The descriptions and postfire signs of fire spread in the Cache Bar drainage indicate the possibility of a phenomenon Richard Rothermel described as “flame attachment” to a slope. 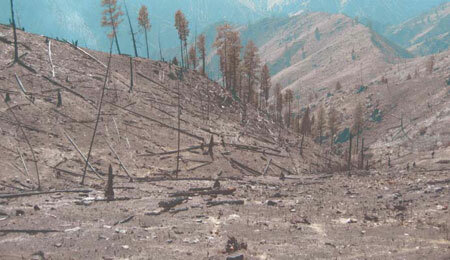 This occurs when fire is burning on a steep slope and the convection from the fire cannot move away from the slope. The result is that convective heat and the main part of the flaming front stay closer to the surface, preheating the fuels and increasing the intensity of the flaming front as it passes through an area (figure 34). Figures 35 through 38 show crown drying, directional needle and branch freeze in conifers, and crown consumptions patterns that indicate flame attachment on the slope below H-2. Figure 34—Descripton of the “flame attachment” phenomenon.—From Richard Rothermal, 1989 BEHAVE fire prediction and fuel-modeling system, BURN subsystem part 2. Figure 35—Crown scorch and consumption in the stand of trees below H-2 (foreground), indicating flame attachment as described in figure 34. Figure 36—Crown consumption and directional needle freeze in the stand of trees below H-2. Figure 37—Upslope needle freeze at the base of the stand of trees below H-2. Crowns were dried but not consumed by the fire in the lower portion of the stand. 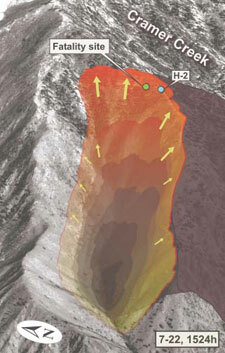 Figure 38—Upslope needle freeze on the ridgeline immediately west of H-2. When the fire front reached H-2, postfire site conditions indicate that surface temperatures were from 1,300 °F to potentially over 2,000 °F in the crowns. 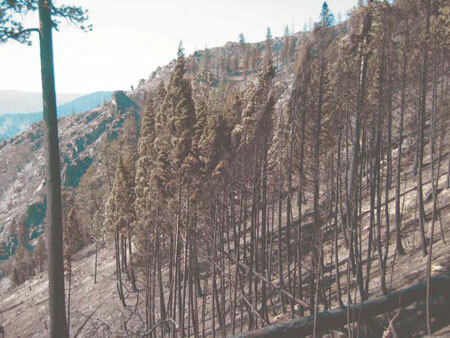 Flame lengths were reported to be 50 to 100 feet as the fire moved to the top of the stand of trees below H-2 (figure 39). 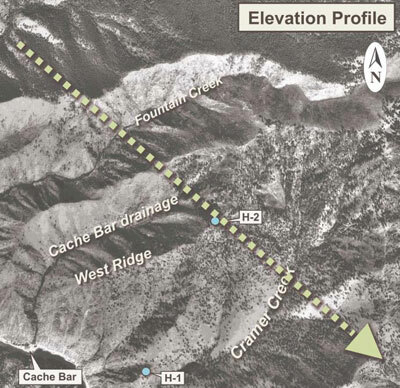 Reports of spread rates in the upper part of the Cache Bar drainage vary, but are consistent with the preliminary modeled spread rate of 400 to 600 feet per minute (4.5 to 6.0 miles per hour) during the final run from the base of the slope below H-2 to H-2. Figure 39—The upper Cache Bar drainage after the fire front passed. 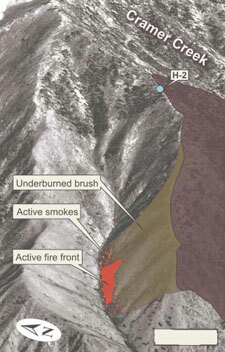 After reaching H-2, the fire continued to spread beyond the upper end of the Cache Bar drainage to the east, burning into part of Fountain Creek. By 1730, all of Cramer Creek had been burned and the fire had moved eastward into Long Tom Creek. Figure 40 shows the estimated fire perimeter at 1730 on July 22, 2003. Figure 40—Cramer Fire perimeter and spread on July 22, 2003, from 1500 to 1730 (estimate).